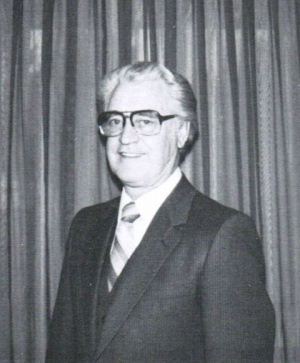 John Derksen: churchman and businessman; born 31 August 1929 in Tessier, Saskatchewan, Canada to Frank Derksen (20 September 1897 - 31 August 1979) and Katharine (Kehler) Derksen (28 April 1898 - 31 August 1979). He was the fourth child in a family of 6; the first 2 of which died of cholera in early childhood. John married Nellie Bergen, daughter of Cornelius Bergen and Helena (Janzen) Bergen, in North Star Mennonite Church in Drake, Saskatchewan, on 4 June 1953. They had five children: Kathy, Tim, Leanne, Marjorie, and Audrey. John died in Abbotsford, British Columbia, Canada on 16 May 2010. When John was 16 the family moved to Abbotsford, British Columbia. He became a Christian in June 1946 and was baptized a year later. John graduated from Mennonite Educational Institute in Abbotsford and then from Canadian Mennonite Bible College (CMBC) in Winnipeg, Manitoba, with a Bachelor of Christian Education. John met Nellie while both were students at CMBC. John and Nellie settled in Abbotsford after CMBC. Here they opened what was to become Derksen's Christian Supply House in 1954, which they operated for 42 years. In John's words, "I am most grateful for having had this opportunity to be of service to the churches and to countless individuals, supplying them with choice Christian literature and supplies." He was also involved in the Clearbrook Chamber of Commerce for several years, as well as in the Clearbrook Waterworks. Besides all of this, he was also very active in the church, especially at Olivet Mennonite Church, where he was congregational chair for 18 years. He also served in the Finance, Music, Worship, or Missions committees at various times. For a while he led the choir and also sang in various groups. He taught youth class and occasionally preached. He was a very meticulous record keeper, always interested in "doing things right" and was not afraid to speak out. In his senior years, John's health and eyesight began to fail, and eventually he became legally blind. Kampen, Betty. "Derksen, John (1929-2010)." Global Anabaptist Mennonite Encyclopedia Online. July 2013. Web. 22 Apr 2019. http://gameo.org/index.php?title=Derksen,_John_(1929-2010)&oldid=134770. Kampen, Betty. (July 2013). Derksen, John (1929-2010). Global Anabaptist Mennonite Encyclopedia Online. Retrieved 22 April 2019, from http://gameo.org/index.php?title=Derksen,_John_(1929-2010)&oldid=134770. This page was last modified on 30 June 2016, at 15:07.